I'm getting a late start for today's pack. So much to do in a day that culminated in my helping out on my daughter's softball team for practice. During sign-ups, I was asked to coach. I respectfully declined, knowing that my schedule would not allow me the luxury of setting consistent practice days and times. I also know my limitations regarding softball coaching. I know a lot about baseball, and assume much of it applies to young girls softball, but I have never coached nor have I ever really taught someone how to play... Especially how to play CORRECTLY at that. Admittedly, I spend most of the practices watching the coach and them I attempt to emulate what he does. How anyone is able to watch arms, hands, head, shoulders, legs, knees, wrists, etc all at the same time for each player is beyond my comprehension level. I'm good to see just one of those things, let alone ALL of them. I figure, the worst-case scenario would be that parents go ballistic over something I did or didn't do. My response will be something akin to, "Feel free to come out here, help out during the week, and take the field. The job is yours." I figure if I can help one child (yes, it would be great if I could help my own, but I'll take ANY child at this point), then I've done what I could. I may not even help them in their playing skills. They may look back on these years and think, "Mr. Henderson was kinda of a wacky guy, but he taught me ____." That's all anyone that coaches can hope for, I think. Well, I've rambled on enough. Let's rip some wax! 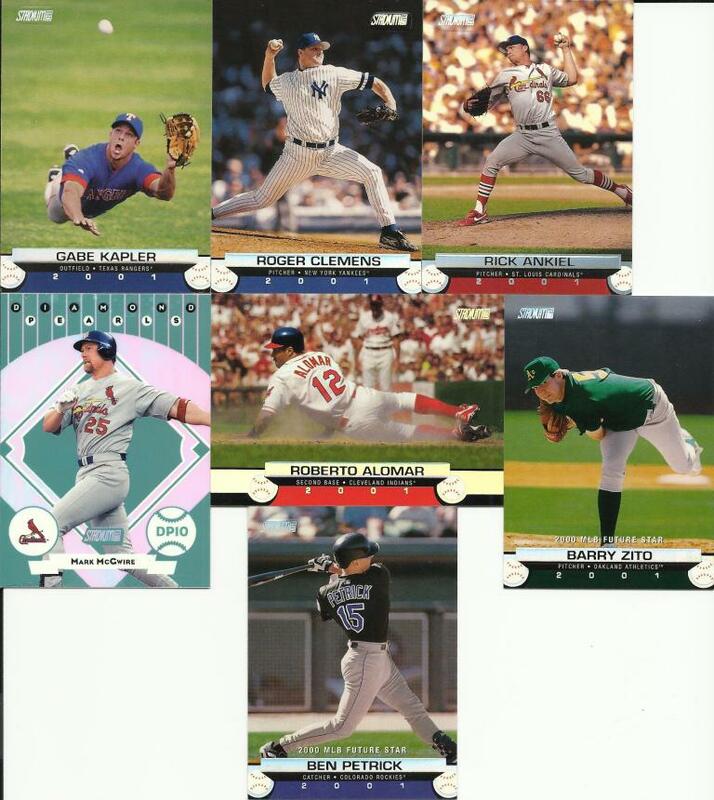 I have a pack of 2001 Stadium Club Hobby. 7 cards per pack. Wow, I'm surprised Zito wasn't claimed before. I bet he goes in the Free Agent draft. The other hits in the pack, though, are great! That McGwire card is VERY cool in person. I hope the scan can even come close. I bet not. Nope. The McGwire is shiny silver chrome. Oh well, Matthew is going to enjoy it for sure, along with the other managers who scored out of this pack! That's a great shot of Kapler. I agree! I also like the Alomar. Nice action shots! I've coached fastpitch at the junior high and high school levels. You're correct, much of what we learned from baseball carries over, especially defensive fundamentals and baserunning. Pitching is obviously different and I still don't feel comfortable critiquing or helping a pitcher with their mechanics. With hitting there are a couple of different philosophies. One is for contact, which was stressed throughout the 80's & 90's, but now there is an increased emphasis on power. Still, with both techniques, many of the same details from baseball translate here as well. Thanks! I don't plan to take any of this too seriously. These are kids. Let them have fun. I'll leave the "sports drama" to the parents out of touch with the reality of that fact.